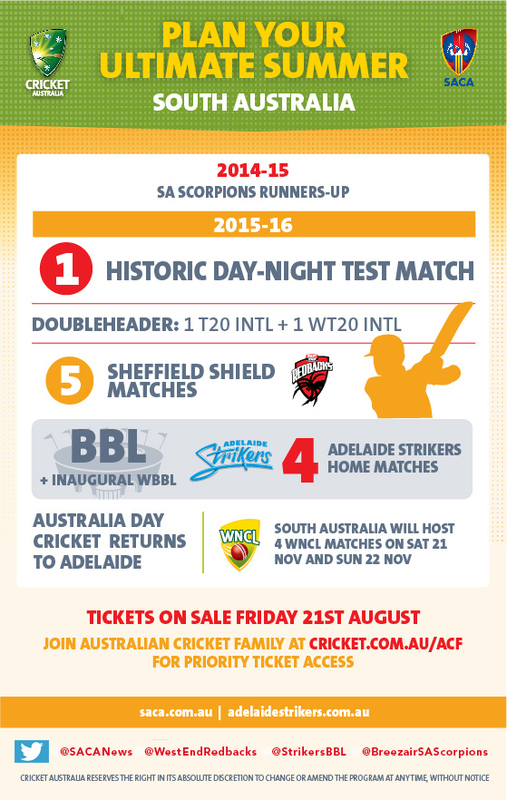 Adelaide Oval’s iconic Australia Day fixture will return this summer as Australia take on India in a T20 International blockbuster on 26 January, 2016. The day will feature a double-header as the Southern Stars take on India in the opening match of the Commonwealth Bank Women’s International Series. Announced last week as the first ever venue to host a day-night Test, today’s fixture announcement is more good news for Adelaide Oval and South Australian cricket fans. “I have always believed that Australia Day should be here at Adelaide Oval; it’s part of our DNA and part of our tradition here in South Australia,” said SACA Chief Executive, Keith Bradshaw. “This fixture is for the fans and we want to make sure that South Australian cricket fans can attend what is an iconic day on our State’s sporting calendar. Cricket Australia today also revealed the Matador One-Day Cup and Sheffield Shield fixtures for the 2015-16 summer, which includes an opening round day-night Shield fixture, giving all states the opportunity to use the pink ball. The match at Adelaide Oval between the West End Redbacks and the NSW Blues from 27-30 October will be the final opportunity for fans to see the pink ball in action ahead of the day-night Test starting on 27 November. The Redbacks’ return clash against NSW will be played as a Phillip Hughes tribute match, with their round eight Sheffield Shield match to be played in Coffs Harbour, located less than 60km from Hughes’ hometown of Macksville. The match is an opportunity for the local community to celebrate Phillip’s life and career alongside his former team mates while supporting the game he was passionate about. The Breezair SA Scorpions’ summer will be broken into three weekends of 50-over cricket including two home fixtures from 21-22 November, while the Women’s Big Bash League will replace the existing T20 competition. The Scorpions will be looking to go one step further in this season’s WNCL competition after making last year’s final against NSW – the team’s first since 2008.